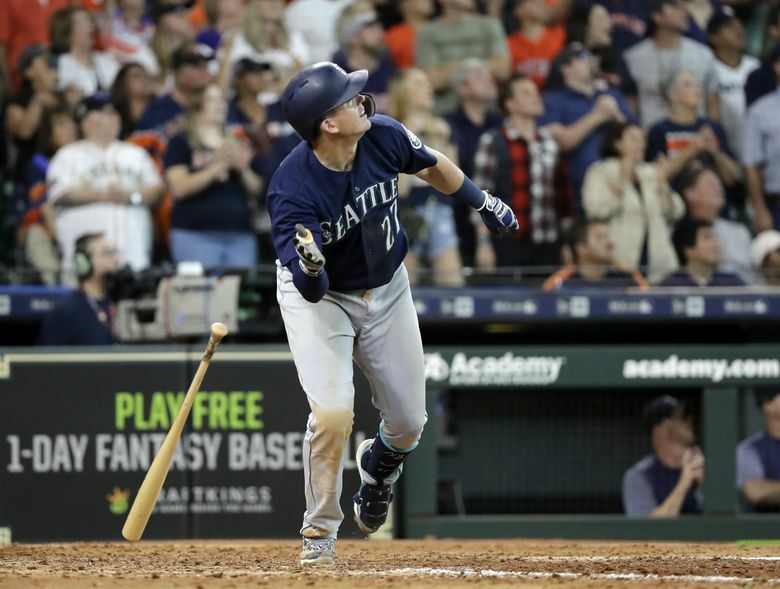 The Mariners got five solid innings from Erasmo Ramirez in his season debut, but after the Astros took the lead with a three-run eighth, Seattle needed the heroics of Ryon Healy and Mitch Haniger to complete its first ever four-game sweep in Houston. HOUSTON — Four days ago, they dressed in angry, frustrated silence. Getaway days following a defeat are rarely ebullient postgame settings, but this was different. The embarrassment of lopsided, back-to-back defeats to an inferior team — the Texas Rangers — and the queasy feeling of a postseason spot, once thought to be inevitable, slipping away had them reeling and more uncertain than at any point in a monthlong stretch of mediocrity. 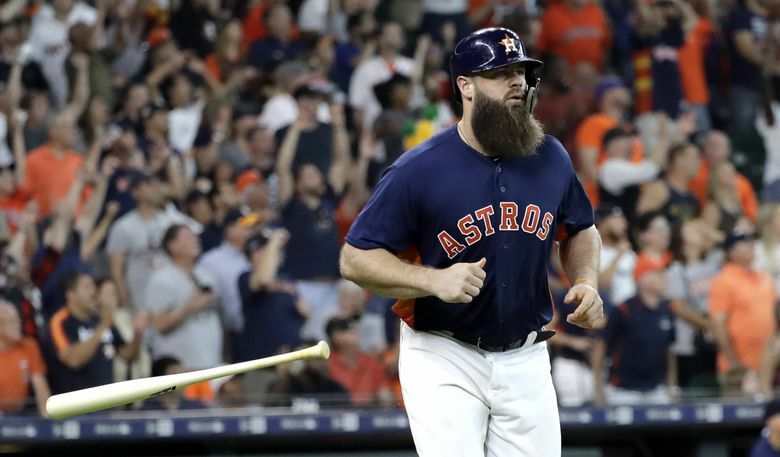 A four-game series against the Astros loomed with the potential to add to their misery and possibly put everything they had worked for in the first few months of the season into something beyond doubt. But by Sunday afternoon everything about the Mariners and their place in baseball had changed. 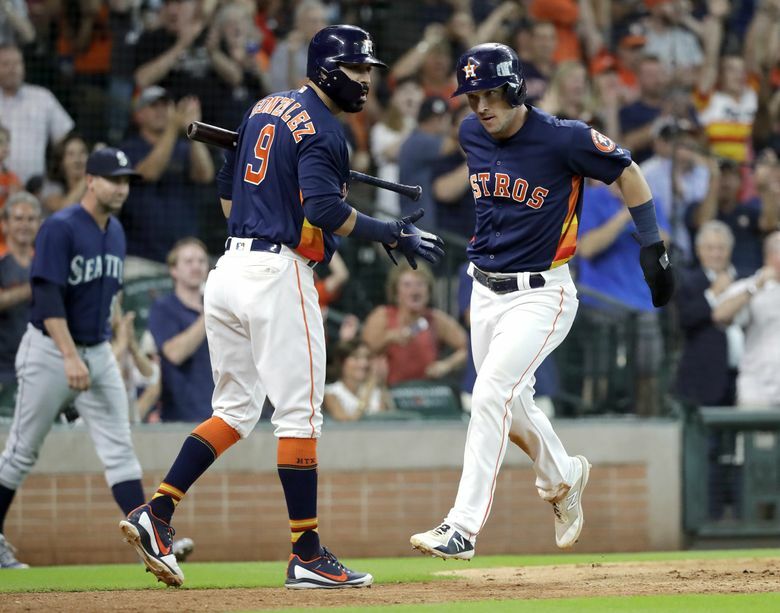 When Edwin Diaz gloved Carlos Correa’s soft ground ball back to the mound and flipped it first for the final out of a 4-3 victory over the Astros in 10 innings, that helpless feeling from four days earlier had been replaced by a renewed confidence and optimism. 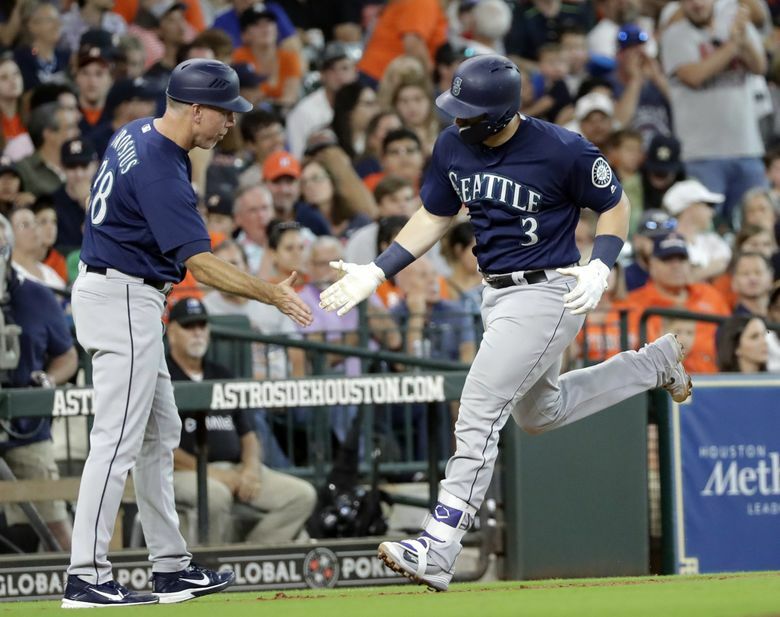 With pinch-hitter Dee Gordon on first base having singled with one out in the 10th, Mitch Haniger smacked a double to left-field corner off Astros reliever Roberto Osuna. Since Gordon was running on the pitch, he scored with ease, breaking a 3-3 tie. After working three straight days and supposedly unavailable to pitch on Sunday, Diaz informed the coaching staff that he wanted to close out a win if there was a chance. He completed his own sweep, saving all four games and running his total to 46. “We are playing the first-place team in the division, and we have a chance to win all four games; they have to know we have a good team,” Diaz said. Diaz showed no signs of fatigue, pumping 98-mph fastballs and showing a biting slider. After allowing a two-out single to Alex Bregman, he retired Correa, his longtime friend from Puerto Rico. It was a stunning turn from the misery versus the Rangers in Arlington and the weeks before that. 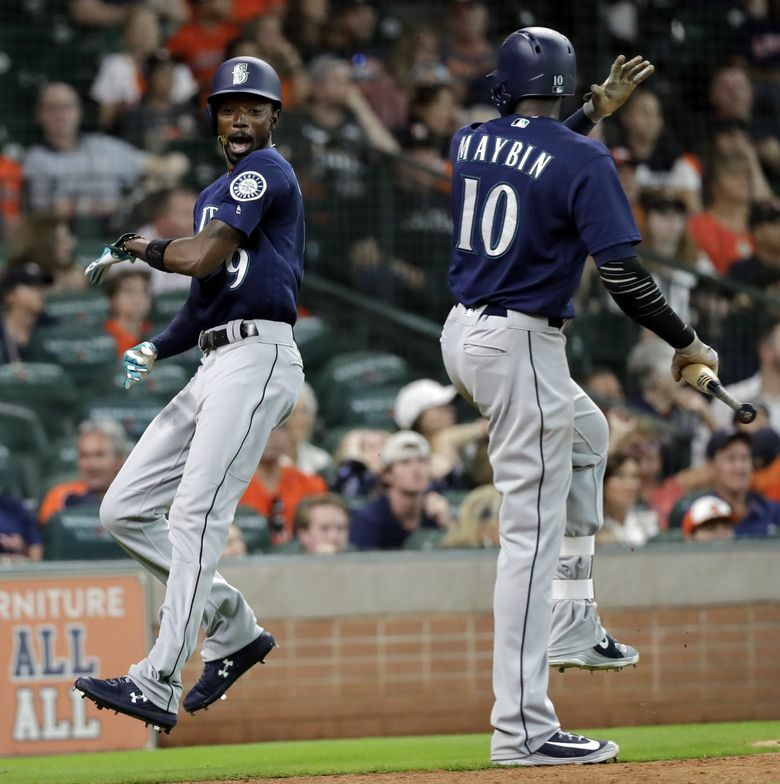 The Mariners trudged into Houston, re-examined what was necessary to their success at the urging of Servais and swept the wounded Astros in a four-game series at Minute Maid Park for the first time in franchise history. Now 69-50, Seattle heads to Oakland for a huge three-game series versus the A’s starting Monday night. Pregame or pre-series speeches are not common, but given what he saw from his team while losing two of three to the Rangers, he felt something should be said. It was a message players embraced. Healy provided the heroics to send the game into extra innings. 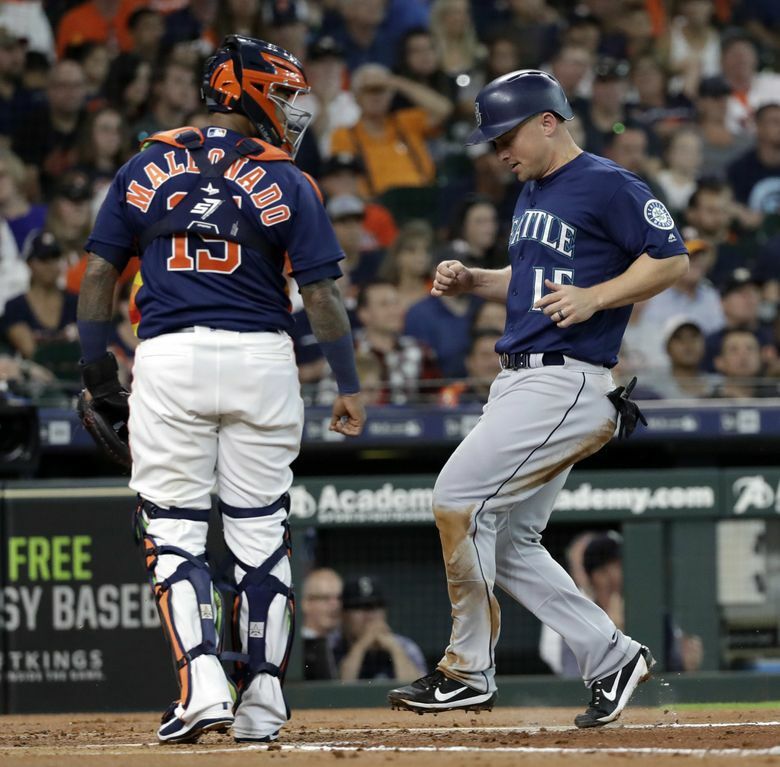 The short-handed Mariners bullpen was without Alex Colome, who was unavailable because of his workload. The duo of James Pazos and Nick Vincent gave up three runs in the bottom of the eighth, squandering a 2-0 lead. But with two outs in the top of the ninth, Healy sent a misplaced slider from Astros closer Hector Rondon into the Crawford Boxes in left field. 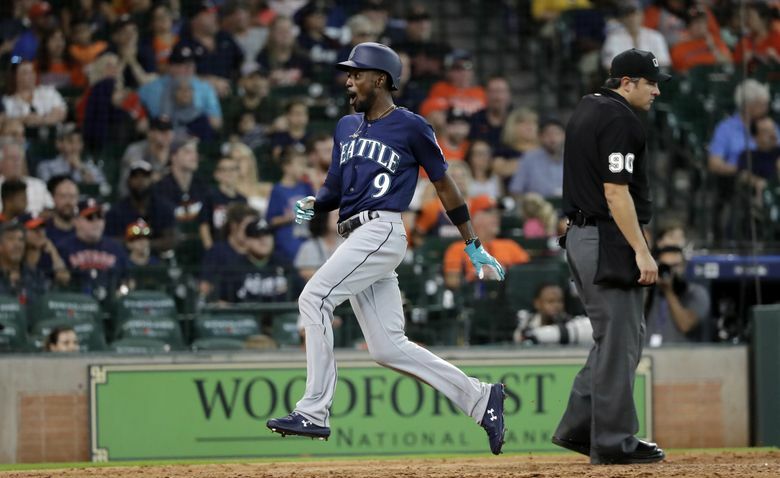 “Nothing bigger than a two-out homer in the ninth to tie it,” Servais said. 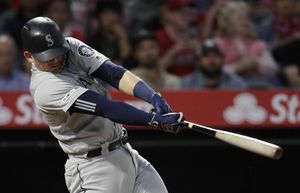 The game-tying homer wasn’t one of Healy’s majestic blasts, but it took advantage of the short dimensions in left field. 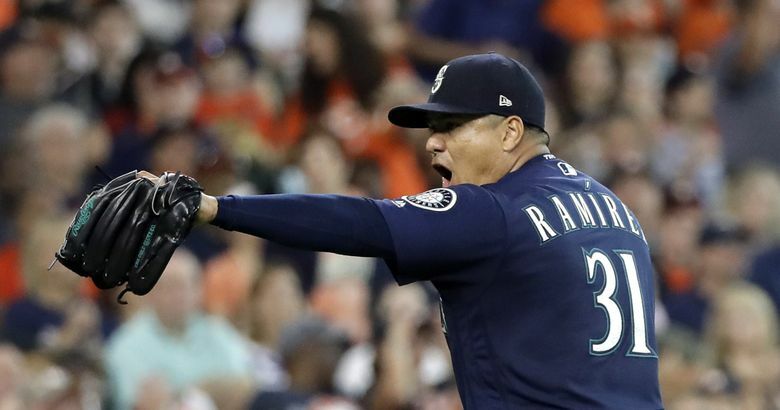 Seattle got a solid start from Erasmo Ramirez, who was taking the place of Felix Hernandez in the rotation. Making his first big league start since April 27, the Mariners weren’t quite sure what to expect from Ramirez. They probably weren’t expecting five shutout innings, allowing just three hits with no walks and three strikeouts on 79 pitches. Ramirez has a reputation as a strike thrower. It’s a reason why the Mariners acquired him at the trade deadline last season. But Ramirez spent most of spring training and the regular season on the disabled list with two different shoulder issues — a lat strain and a strained teres major. Complicating matters was his previous outing on his rehab stint on Aug. 5 with Class AAA Tacoma. He pitched just four innings, giving up four runs on six hits with two walks, and he admitted he had some mechanical issues. 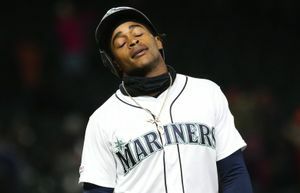 It was to the point where the Mariners had planned to give him another rehab stint. But those plans were revamped when Hernandez had another clunker in Texas. Using a diving sinker, Ramirez allowed just one base runner through four innings. Things got troublesome in the fifth when the Astros loaded the bases with no outs. But Ramirez calmly struck out Kyle Tucker and got Martin Maldonado to bounce into an inning-ending 6-4-3 double play. He celebrated the clean inning with a scream and an uncharacteristic fist pump. Seattle gave Ramirez a 1-0 lead on Healy’s RBI single off Houston starter Dallas Keuchel. 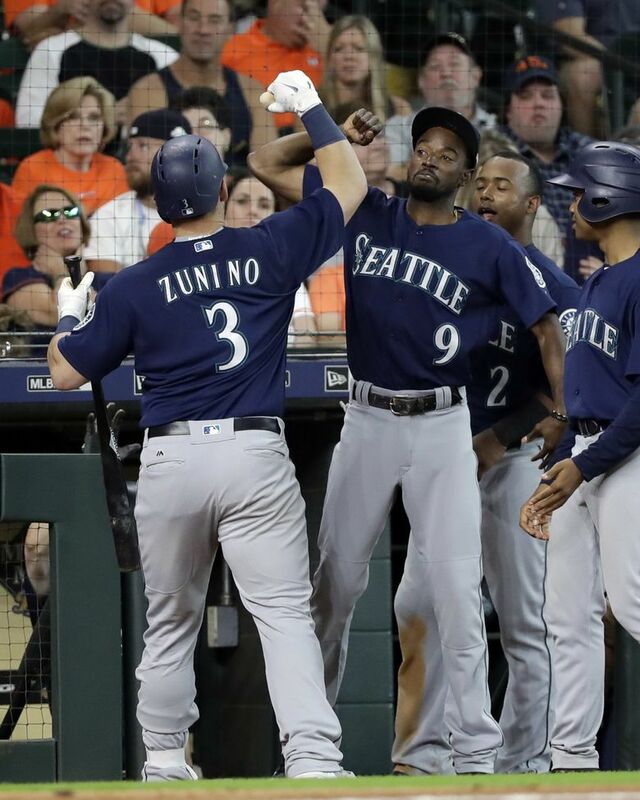 The Mariners pushed it to 2-0 in the seventh when Mike Zunino smashed a solo homer off the glass windows that sit behind the train tracks high above the wall in left field. Statcast measured it at 442 feet.